To classify an object in a image, we must first extract some features out of the image. We will use these features inside a classification tool like C4.5 (decision tree) to obtain the final class. I have made a small package to work with gray-level images (gray color coded on 8 bits). This package has been highly speed-optimized. For example, it uses some "tricks" of demo-coders to allow fast resize of images without any floating point operations nor multiplications (most of the time, one C intruction corresponds to one machine language instruction). All the scalings are done using a "resampling" algorithm (new pixels are the average of old pixels). Here is a small description of the capabilities of the package. It's currently used on-line in a real-time application to classify glass defects. If you are not interrested in the math, you can go directly to the end of the page to see fun examples. When we calculate the two above average we only use the points that belongs to the object we want to isolate. A point does NOT belong to the object if . The parameter s2 must be given. The average are thus calculated on set of points changing at each pass. Let's consider an image with 3 white peaks. Two of these peaks belongs to the object to classify, the last one (far away from the 2 others) is noise. We want to crop the image so that only the object to classify remains. The algorithms begins by searching the point which has the Gray Level the further away from 128 (128 is now the color of the background: see previous step: noise cancellation). This point will usually belong to one of the two peaks evoked before. From this point we will make a "special flood fill" (see end of the section to have a more precise description of the flood fill). The program draws a rectangular box around the zone which has been colored by the "flood fill". Everything outside this box is cropped. Ideally, the "flood fill" should color the two right peaks. Unfortunately, there is very often, between these 2 peaks, a zone of the image at 128. This zone prevents the "flood fill" to expand up to the second peaks. To overcome this difficulty, the "flood fill" is executed on a reduced copy of the original image (horizontal scaling:s4, vertical scaling: s5). Based on this colored copy, we crop the original image. The algorithm start from a given pixel. Then, It colors all the adjacent pixel. 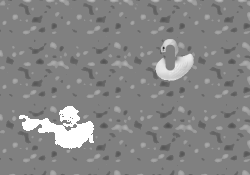 The coloring stops when we find a gray level such that with and =gray level of point . NOTE: This algorithms works with white or black objects. No problem. If the image to classify is still to big, we must crop a little bit more. We can create a new "cuted" image which contains ( should be 90 or 95) of the luminosity of the original image. The luminosity of an image is defined by the sum of the gray level of all the points in the image. find the center of gravity of the image (the weight of each point C is weight= ). put a box of dimension (1,1) around the center of gravity. extends this box in the direction which increases the most the weight of the box. go to point 3 while the luminosity of the box is lower than of the global luminosity. number of peaks in the x direction. For each column of the image, we calculate the average of the gray level. This average follows a curve . To be less sensitive to the noise, we count the number of peaks of the curve with . number of peaks in the y direction. Slow feature extraction: image correlations. (non-commutativity of the correlation operator). ( )' is the image after a rotation of 180°. The star * is the convolution operator. With the convention that and . The equation 5 is way to slow. We will use an other technique. For the calculation of the correlation between two images of size (128,128), this second technique is more than 100 times faster than direct application of equation 5.
with the Fourier transform of the image I.
with = transpose of x. The convolution operator is a simple multiplication in the Fourier domain. For each point, we calculate only a single multiplication. The Fourier transforms are calculated using an algorithm called FFT: "Fast Fourier Transform". This algorithm imposes that all the dimension of the images are exactly a power of two: 2,4,8,16,32,64,128,256,512,... We will pad (enlarge) the images to have an allowed size (with zero's). 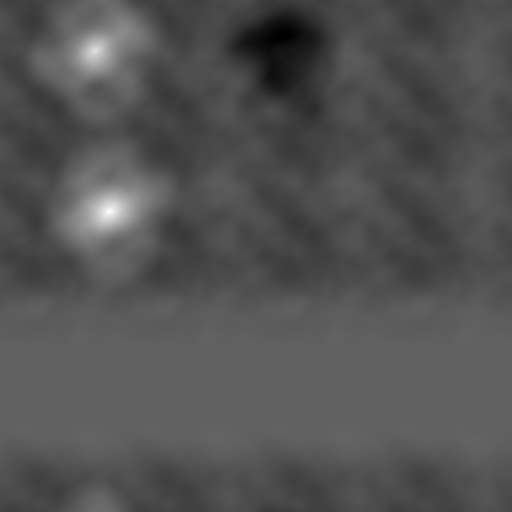 The correlation of two images is available only for images where the gray level is coded on a double ("ImageD" class). There is a simple function which creates "ImageD" images from normal images where the gray level is coded in integer on 8 bits (normal "Image" class). It's interesting to calculate the correlation of the images that you want to classify with "prototype" images to see "how close they look like". This feature is very slow to calculate but it usually contains lots of useful information. The result of the correlation calculation is an image. From this image, we will only use (as a feature to inject inside a classifier) the greatest value of the color of the pixels of . We have an image 'input.png' with noise on it. We want to know if this image is a duck or a tomato (classification in two classes). 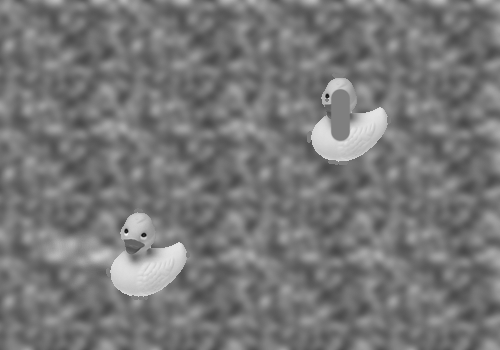 We will do a correlation of the input image with one reference image of a duck ('duck.png') and one reference image of a tomato ('tomato.png'). The result of this correlation will be used to determine in with class belong the image 'input.png'. Everything which was near the "neutral" background gray level 128 has been rounded to 128. We will now isolate the only object of interest in this image (later we will compare this object with the 2 reference objects). We will use a cropping technique. The "flood fill" has covered all the object of interest. We are now ready to start the correlation with the reference images (do not forget to pad the images to a size which is a power of two). The correlation between the input image 'input.png' and the reference image 'tomato.png' is 4.956055 (value extracted from 'corr3.png'). 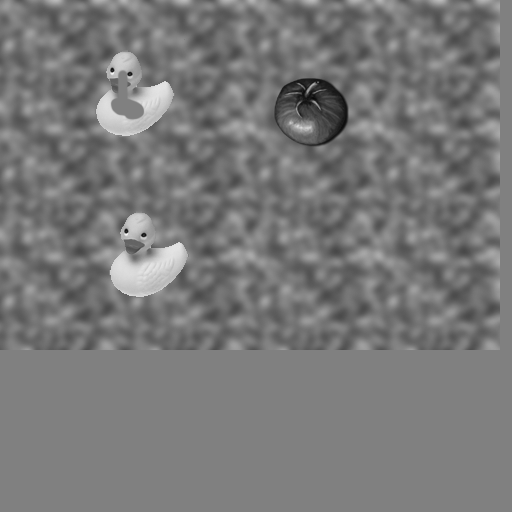 The final results is that (hopefully) 'input.png' looks more like a duck than a tomato (1291.486084>4.956055). The whole calculation time for the 2 correlations is lower than 80ms on my P3 600 MHz. Thanks to the FFT algorithm! Note the two white spot locatted exacly at the position of the duck inside 'input2.png'. 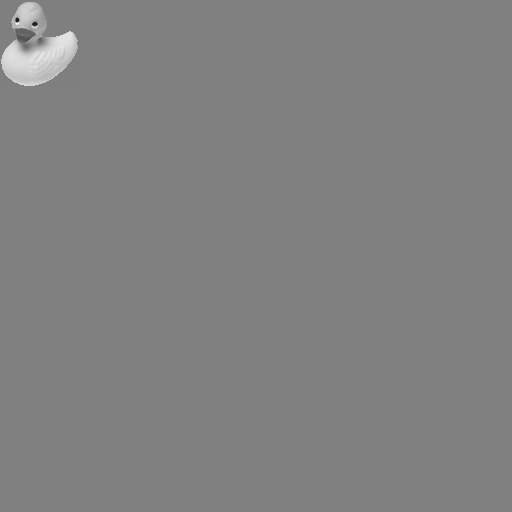 The white spot which is beneath is brighter because the 'input2.png' ressemble the most at a duck at this position. The emplacement of the tomato is visible thanks to the black spot. Calculation time for this correlation is about 3s on my P3 600 MHz. The mathematical part of this page is downloadable here in PDF (unfortunately, it doesn't contains the fun examples).